Perfect for when your child has outgrown their crib and is ready to move to a toddler bed. 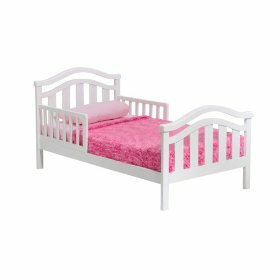 The Delta Children’s Products – San Tropez Wooden Toddler Bed will certainly bring a touch of class to your toddlers bedroom decor. There are two side rails to ensure that you toddler doesn’t roll out of bed and because it is low to the ground your child will find it very easy to climb in and out of. This toddler bed has been designed to use with a standard crib mattress. All but one of the customers who brought this bed gave it 5 stars. The one customer who gave the San Tropez wooden toddler bed four stars, did so because they found the instructions hard to follow and that the holes in the bed did not line up. Once it was finally put together both she and her son love it. Everyone else received a bed that went together quickly and easily. The lightweight bed is made from solid wood and has a white finish making it a piece of furniture that will fit any decor. It is recommended for use by children of ages 18 months to 5 years old. Sponge Bob is a popular character with youngsters and this comforter is suitable for kids from juvenilles right through to teens. This twin-sized comforter features SpongeBob Squarepants and Gary. 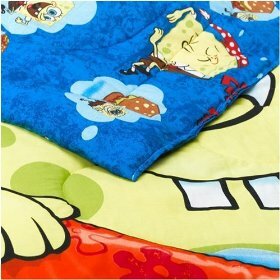 The SpongeBob Squarepants Bed Twin Comforter can be coordinated with the Bed Bob bedding ensemble but really you could mix and match this comforter with any of your childs favorite bedding. The set is reversible so that if your child tires of one picture, the comforter can be turned over to show a different picture. The comforter is made from 55% polyester and 45& cotton and the filling is pure polyester, so it is easy to care for as you can pop it in the washing machine and the dryer. 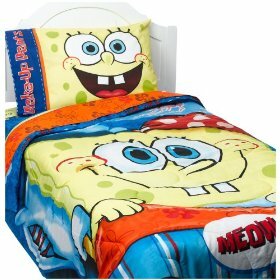 This SpongeBob SquarePants comforter is available in twin size and measures 86 inches by 64 inches and it is also available in full size, measuring 86 inches by 76 inches. You can also add sheets, pillowcases, valances and plush pillows for a coordinated look to your childs bedroom.